The subject dealt with in this volume, so far as the writer knows, is virgin soil ; no book has appeared, here or abroad, on the subject of stallwork. Abroad, the great mass of stallwork has perished ; sometimes at the hands of pious vandals, often through neglect, more often still through indifference to or active dislike of mediaeval art. 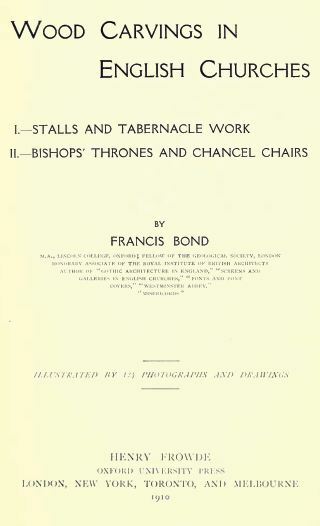 In the stallwork of Belgium not a single tabernacled canopy remains ; in France and Italy the great majority of the Gothic stalls have been replaced by woodwork of the Classical design that was dear to the seventeenth and eighteenth centuries ; only in Spain can the wealth and splendor of English stallwork be rivaled. In England a great amount of magnificent stallwork still remains ; on the stallwork indeed and the concomitant screens time and labor and money were lavished without stint in the last two centuries of Gothic art. Hitherto, however, this important department of English medieval design has almost wholly lacked recognition and appreciation ; attention had not been called to its value in the study of artistic woodwork, and even the most splendid examples of this branch of English art have been passed over with uncomprehending indifference. Vet it is no overstatement to say that there is nothing in this country more consummate in design or execution than the stallwork of Lancaster, Chester, Ripon, and Manchester. To most of the readers of this volume the illustrations which have been here gathered together will come as a revelation of beauty and interest. It is to be hoped that the book will help to inform those who are heritors of a great artistic past, will make them proud of their heritage as Englishmen, and faithful to preserve it and hand it on in turn unimpaired to their successors. The art is in the main English art, as English as the timber in which it is wrought, and deserves the attention of all English-speaking people the world over, who inherit equally with ourselves the good things that remain from the England of old.